Tech Report - Do You Think Gene Editing Can be Considered Ethical or Moral? Do you think gene editing is considered ethical or moral? Is it right for human beings to tamper with something so vitally important as our DNA? As the possibility for more advanced genetic modifications even in human beings becomes increasingly probable a lot of ethical challenges and questions are still left unanswered, its time to push these conversations a lot more aggressively before its too late. In a recent article published by Forbes entitled 'Advances In Genetics Are Setting Off A Fresh Wave Of Ethical Concerns' some interesting details were presented regarding this issue and some extremely valid questions were posed. For example, what are some ethical challenges that may arise from advances in genetic modifications? Well, I think tampering with human beings in an effort to create 'super-humans' is essentially delegating normal people to a sub-class of humanoid more than a bit worrying. So lets have a look first at how far we have come in terms of regulation around this practice. Just a few weeks ago, an FDA panel approved a gene editing technique to cure a rare form of congenital blindness called Leber congenital aumaurosis (LCA). This in itself is promising and a worthy application of gene editing. The cure for congenital forms of blindness is one of the gene editing techniques is apparently an area that geneticists have made a lot of progress in. For example, they have been able to gene edit out red/green color blindness in squirrel monkeys since at least 2009. It's interesting to know that the cure for LCA was discovered around the same time. a humane way. There will be benefits to applying genetic editing to curing illness and disease and this alone is proof that simplying eliminating genetic editing is not an option when it provides so much potential benefit in ending human suffering. But hold on for a minute, we must ask the question here, just because we can cure some things, does it mean that we should? This is an interesting moral dilemma which seems comparable to playing god. How would nature deal with these diseases? Why do these diseases exist in the first place? Some may argue that this is a biological safety mechanism to control populations on a planet. Here's another perspective. In a book written by Andrew Solomon called Far From the Tree, the author brings up the deaf communities of the world in a way we might not imagine them. He talks about them as not just people living with sensory deprivation, but rather they represent a rich thriving culture, with members who would readily argue that their senses, thanks to deafness, are enhanced. So, we have reached a true moral dilemma, if the deaf really need to be “cured," whose decides to do it? Hearing parents who want a child like themselves? The child? And at what age is someone old enough to make this life changing decision? Should it be at Age 5? Should it be at Age 18? Perhaps when they grow up and possibly fall in love with someone in the hearing world or have hearing children? Then wouldn't the opposite also be available? What if people had the ability to choose deafness by the same token? Perhaps some deaf parents may decide it would be best to take away the sense of hearing from a hearing child so they would have the opportunity to “fit in” better with their family? This poses another interesting factor in the debate. Is being deaf truly a disease? Could it not be a blessing in some ways or at bare minimum, nature's way of creating diversity and the potential for limitless experiences. I'm not arguing that people born deaf shouldn't have the option of gaining their sense of hearing. If modern medical therapies can provide that for them by all means, I do believe it should be offered. This past summer, CBS reported that genetic testing had become so commonplace in Iceland, that pregnancies with embryos believed to have three copies of chromosome 21 instead of two, were routinely terminated. It needs to be emphasized that the population of Iceland is under 350,000, and the average Down’s birth was two per year, however, recently, so few babies have been born with Down Syndrome, that if this trend continues, eventually no one with Down’s will be born in Iceland. While many people would argue that people with Down’s are less healthy and experience more challenges, others would say, many live long healthy lives and are better for those challenges. This question has me a bit boggled and confused I'm afraid. On one hand, I don't wish Down Syndrome upon anyone or their family but on the other hand can humanity provide this advantage to the billions of future parents living on this planet? I am however amazed to learn that Iceland is implementing genetic screening and I'm quite happy to see technology being used in a positive and humane way. I just wish this wasn't solely an advantage received in so called 'first-world' countries and applied to the developing and third world countries as well. Who owns our DNA brings up its own host of complicated questions. If I ask you, who should own your DNA, what is your gut answer? You, right? We should each own our own DNA. But let me kill the suspense here, if you do 23andMe or any of those other boutique genome mapping experiences that tells you your ethnic background - YOU DO NOT OWN YOUR DNA. So do we own our DNA or not? Should we be more careful and develop stronger moral and ethical guidelines before persuing more advanced gene editing methods in application to human beings? What do you guys think about this? Very important questions! Indeed disappointingly low response. I think we simply HAVE TO apply genetic editing to curing illness and disease. It is not playing god, because - if the concept of god - is accepted, then he/she "gave us" the gene editing, right? He/she allowed us to develop that far that we have an influence on our further evolution, even by changing our DNA. We didn´t played god, when we came down from the trees and walked upright, nor did we ask god before we started to manipulate atoms and did the atomic fission and fusion stuff. So far our society is already allowing chronic ill people to get treated even at high costs - to even have a normal life, if possible (and produce offspring which in nature probably would not be possible), sooner or later gene editing will be considered just a fancy new tool to accomplish in principle the same things. 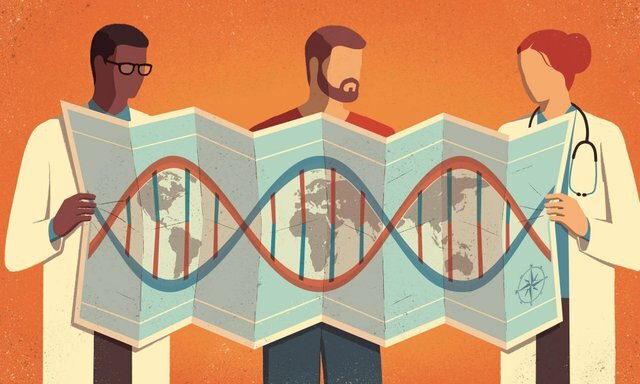 Of course, the first cases will be discussed intensively, but in the beginning it will be very few, spectacular success cases that will pave the way for a second wave of gene editing, less spectacular, but maybe affecting more people, and so on. And at the end nobody will be interested at all. Like it is with many things. Should we establish "stronger moral and ethical guidelines before persuing more advanced gene editing" as you say? Definitely, and also more transparency of who owns the data. That privately held companies OWN your DNA is totally unacceptable and for this reason I would never do those self-testings you mentioned. Well, that's a remarkable absence of response. I feel a bit overwhelmed trying to answer all of it, so I'll just toss in an opinion or two from what stuck in my memory. The idea of gene-edited critters that escape to the wild and interbreed with their natural "cousins" -- with completely undetermined consequences -- scares me. I'm all for furthering scientific knowledge generally, but this is playing with genetic fire. As for people making genetic choices for their children, parents make far-reaching choices for their children all the time anyway. It scares me too. It will happen and may have already happened repeatedly. A gattaca like world with genetically modified elite humans may be in the cards as well.. Meanwhile people are still busy sitting on sofas scarfing down fast food asking each other what they want to watch on tv tonight... I've got my eyes on topics like these on the edge of my seat watching how they develop!